The last week of passing 2011 march was a very hot week for Norwegian scale modelers. Temperatures indeed were high in the relatively cold country, thanks to the excitement caused by Skala - the national Norwegian scale modelers contests. Modelers from nation wide arrived to Dal, a small place about 50 kilometers from the capital city Oslo. The contest, organized by the Norwegian chapter of IPMS, gathered modelers from all over Norway, along with some international guests. 78 participants arrived with no less then 270 models, to compete in categories that varied from cars, airplanes and ships, to dioramas, AFV, soft-skins and so on. Skala also had Spencer Pollard from the United Kingdom and Juha Airio from Finland hosting master classes for the modelers participating in the show. Those classes are reported to have been a great success, and I am glad that we had the opportunity to see how the world class masters work. Mig is 1/32 scale. Unfortunately Skala is dominated by aero and car modelleres, so not many pictures are available... LINK LINK This Special forces dio is really really really interesting!! I would love to see it live to make some detail pics as references for my dios... Where is the Quad/ATV from? Never seen a 1/35 kit for a quad! 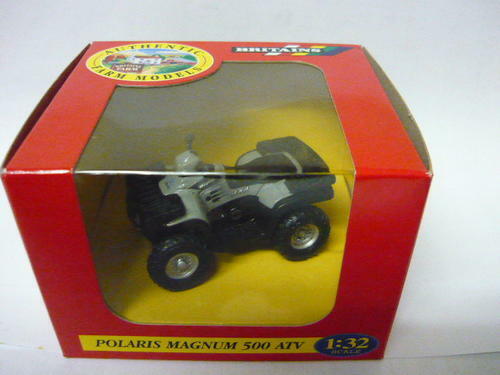 I think this could be the 1/32 Polaris from "Britains" what do you think? I have one of those 1/32 polaris ATV's and they are a good scale. I'm thinking of making mine into a CCT quad. I think a member on here somewhere was modifying one. hey grimmo that sounds interesting, keep us(especialy me ) informed about this project! that's true, it is a modified Polaris magnum! LOL, as a father of four I can easily say that I would be seriously worried if any of the younger ones even knew what that was. Not nearly as offensive to me as the overweight dude in the Speedo in one of the photos. A close-up? Seriously??? At the same time, slapping a set of wheels on any old household item is SO uninspired. That was only meant for the shock value. Put some flames, a blower and a cockpit (no pun intended) on it and maybe you have something. Best comment is to use it as a means to get your wife into modelling. Problem is she'd not want to put wheels on it so there goes the modeling. Unless of course you need to keep her occupied so YOU can build?? ?